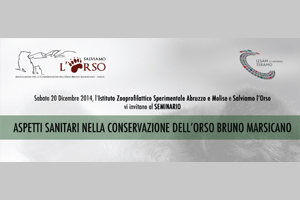 IZSAM and the environmental association “Save the bear” are organizing a technical scientific seminar entitled “Health aspects of the conservation of the Marsican Brown Bear”, which will be held on Saturday the 20th of December at 3.00 p.m. at the Torre di Cerrano. Several experts of the Association and the Local Health Units (ASL) will participate in the seminar and illustrate the activities in the health sector and the ongoing projects for the protection of the plantingrade, with a look at the status of conservation and protection in the Molise Region. 3.00 p.m. – Presentation of the project “Taking care of the dogs who save the bears”, by Mario Cipollone (secretary of the Onlus Save the Bear). 4.00 p.m. – The health monitoring in the area of the Marsican Brown Bear: results and criticalities of the C2 actions and Life Arctos, by Adriano Argenio (veterinarian of the Conservation Office of the Abruzzo Region). 4.30 p.m. - The Marsican Brown Bear in the Molise Region: recent data, by Antonio Liberatore (veterinarian of the Regional Health Unit, Molise). The seminar and the following debate will be chaired by Doctor Carla Giansante of IZSAM.